A city in Central California last week approved a resolution to rename a park after a Sikh human rights advocate who was killed in 1995 by police officers in India. In a unanimous decision, five members of the Fresno City Council voted Thursday to change the name of Victoria West Community Park to honor Jaswant Singh Khalra, who exposed the killing and cremation of innocent people by police in two districts of India’s Punjab state, according to the Supreme Court of India. Two members of the council were not present at the meeting. Khalra’s daughter, Navkiran Kaur Khalra, attended the vote. She told NBC News that her family was honored that her father’s work has been recognized. “Naming the park is recognizing what he did and inspiring future generations that no matter how hard the situation is that you have to be the light in that darkness,” she said. In 1994, Khalra was investigating the disappearance of a friend when he discovered that police had cremated him and labeled him as “unidentified and unclaimed,” according to a 2005 report by Ensaaf, a U.S.-based nonprofit pursing justice for state crimes in India. Khalra further investigated these cremations along with another Sikh man named Jaspal Singh Dhillon, eventually presenting his evidence to the Supreme Court of India with an organization called the Committee for Information and Initiative on Punjab. According to the Central Bureau of Investigation in India, 2,097 people had been illegally cremated in three districts of Punjab state between 1984 and 1994 though human rights advocates have said more than 6,000 could have been cremated. On Sept. 6, 1995, Khalra was abducted from outside his home, according to the Supreme Court of India. He was killed by Punjab police officers the following month and his body was dumped in a canal, never to be retrieved, court papers said. Five police officers were eventually convicted in Khalra’s death, receiving life sentences in 2007. The resolution to rename the park in Fresno was introduced by City Councilmember Oliver Baines. Last year, Baines also helped pass a resolution recognizing the 1984 anti-Sikh riots in India, which killed nearly 3,000 according to Reuters, as a genocide. Baines, who has served on the city council since 2010, said he worked with the nonprofit Jakara Movement for about a year before introducing the resolution to rename the park. He added that, to his knowledge, there are no monuments in the city named after any South Asian individuals. “The Punjabi community represents the fourth largest community in Fresno and ... it's almost as if we haven’t recognized them as the valuable community partners that they are and valuable cultural partners to Fresno. So it was important to make sure we’re including the Sikh story and the Punjabi story in the larger fabric of Fresno,” he told NBC News. According to the U.S. Census’ 2015 American Community Survey, approximately 10,000 people of Asian Indian descent live in Fresno. This 2016 image, taken from Google Street View, shows the newly renamed Shaheed Jaswant Singh Khalra Park in Fresno, California. Signage reflecting the park's new name, Shaheed Jaswant Singh Khalra Park, is expected to be installed in the fall, Baines said. The park is located in west Fresno, which is home to a large Punjabi Sikh population, according to Deep Singh, executive director of the nonprofit Jakara Movement. Sikh residents are also frequent users of the park, Singh added. “Naming of the park represents the best values that we can strive toward: A person that’s willing to give their life in the pursuit of truth, justice, and human rights,” he said. 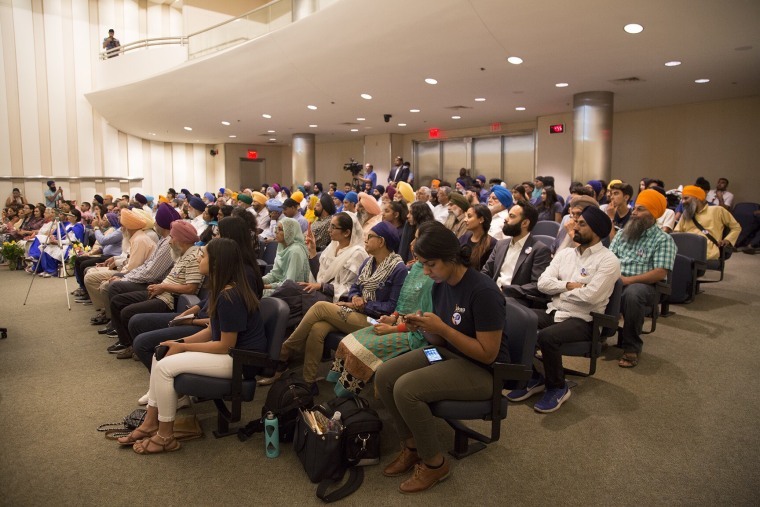 Khalra's daughter said that, as a member of a community that is a minority both in India and in the U.S., she feels it is important for Sikh youth to have people who have made a difference in the community to look up to.